A new series ‘The Way We Were’ is an unashamed nostalgic examination of aspects of the first 200 years of United States’ history. The Way W e Were: The Open Skies looks at the way that air travel- embraced by the American people more than any other nation- took over from long-distance rail road transportation. As you fly over the countryside in a modern jet-powered aircraft covering hundreds of miles per hour, it is easy to forget that our ability to benefit from powered flight is just barely over a century old. 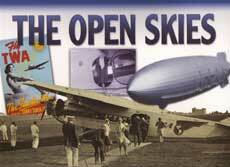 The Way We Were: The Open Skies starts by examining the earliest years of flight- the ‘air fever’ that caught up so many pioneers after the Wright Brothers successfully flew the first powered aircraft at Kill Devil Hills, North Carolina, in 1903. It looks at the balloons and airships that were of great importance in the twentieth century: for nearly seen as the way ahead for intercontinental travel until a spate of publicized accidents halted the technology in its tracks. 164 pages, 12.4 x 11.2 x 0.7 inches, HB w/ dust jacket.